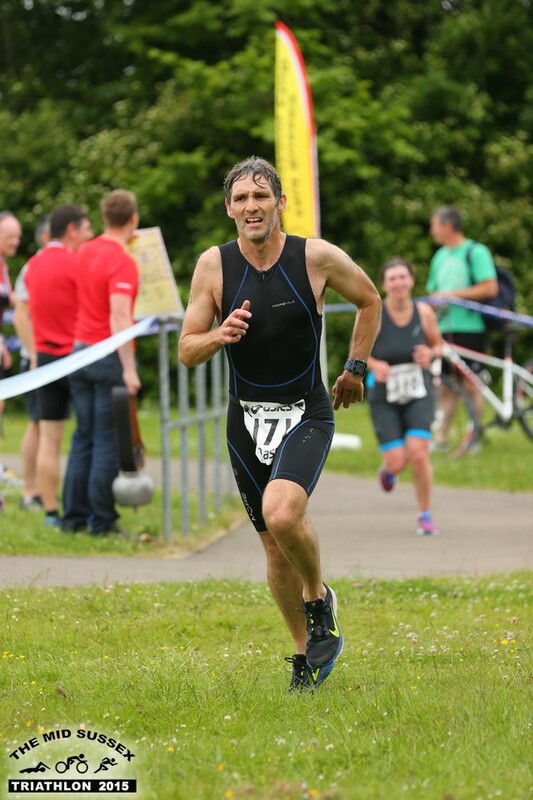 On Sunday June 14th I made my way to the Triangle Leisure Centre at Burgess Hill, West Sussex to take part in the Mid Sussex Triathlon, organised by the Mid Sussex Triathlon Club. It was to be my first triathlon and I had no intention of filming it. However, at the last minute, with no real plan, I took the GoPro and asked my wife to film bits here and there. It’s certainly not my most accomplished film but, if you are planning to do this event in the future or indeed any sprint triathlon, it does give you a taste of what it’s like. It was an overcast day, no rain, no wind and not cold at all. My start time was technically 7:57am so we arrived in good time to make sure I could register, set my bike up in the transition area and get changed. Inside the leisure centre I was given my race number, you can either pin one to your front and one on your back, or you attach one to a race belt and simply turn the race belt around in transition between the bike and run. I was also given a number sticker to put on my bike and had my number written on my arm and hand. The sticker for the bike is for security essentially, so they can check you are taking the right bike out. Once I’d registered I got my bike out of the car, put the front wheel on and made my way to the transition area which, at the Mid Sussex Triathlon is the tennis courts at the rear of the leisure centre. What a selection of different bikes there were!! Mountain bikes up to £3000 triathlon road bikes. Regular triathletes seemed to have a set way of laying out all their stuff beside their bikes. Towels, nutrition, shoes, helmets, glasses all neatly arranged. One guy told me it’s all for show and not to worry about it. So I didn’t. We had a little while to wait before the pre-race briefing, which was held just outside the transition area. I was amazed at how many people were stood there just in their swimming gear. Their race numbers suggested they were not due in the water for at least an hour. Fair enough if you are going to be setting off first but to be in your gear so early seemed crazy. It wasn’t cold but it certainly wasn’t warm enough to be in a swimsuit outside for too long. Race Director, Steve, talked us through the rules and gave us some general guidelines. Seems there were quite a few other first timers today, so I would not be alone! Steve is a jovial character and made it feel like a very friendly community event. Following the briefing, which certainly made me feel a little more relaxed about what was to come, my wife and I made our way to the viewing area in the pool to watch the first swimmer take to the water. On TV you see a mass of swimmers all racing in to the water at once, kicking each other in the face as they scramble for position. Not so here. 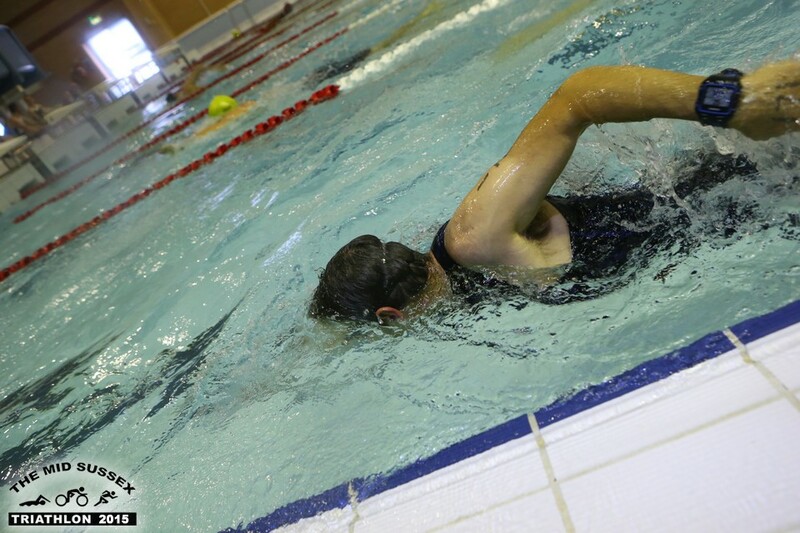 Each swimmer starts alone based on their predicted swim time. So swimmers who expect to be the slowest start first and every 20 seconds another competitor starts. Based on my training, I can do 400m in around 8 minutes, which put me pretty much in the middle of the ability range. Once the first swimmers started it became apparent that the organisers were not strict about starting in exact number order at all. You could basically just decide when you wanted to start and go down to join the queue. So, once changed, I waited until around 7:30 and joined the back of the queue at the side of the pool. 400 metres is 16 lengths of a 25 metre pool. Swimmers did two lengths in lane one and then ducked under the rope to lane two and did two lengths there, gradually making their way across the 8 lane width of the pool to exit on the other side. As I approached the front of the queue I certainly wasn’t nervous about the swim. I swam competitively as a child and I know I can swim fairly well, if not super fast. So I know I could do a decent job in the pool. 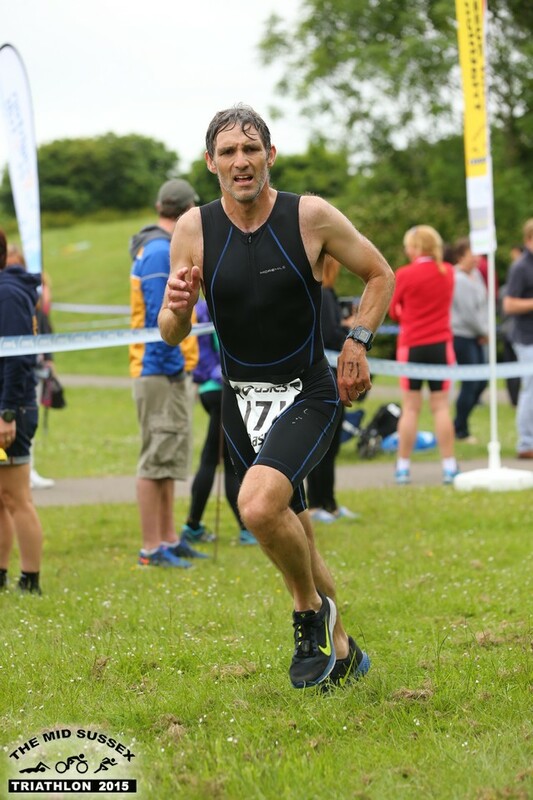 “3-2-1 GO” and off I went in the Mid Sussex Triathlon 2015. Of course adrenaline kicked in and I went off a bit too hard but I felt ok. I even tried to smile for the official photographer but when I looked back at the pictures he didn’t get it. I finished the 400 metres in 7:55 according to the official results. My Garmin 920xt watch says 7:51 but who cares about 4 seconds eh!! I jogged out to the transition area to get on the bike. Helmet on first. Cycling shoes on. Get the bike and away we go. I was a little slower in transition than I would have liked as I had not identified where I should exit. So I wasted a few seconds asking “where do I go?”. Once over a yellow line on the ground you are allowed to mount your bike. My wife was there to film me as I started the 25km ride. This was the big unknown. I have done quite a lot of work on the bike over recent months, but pretty much all of it on the trainer indoors. I’ve not actually ridden outside in the real world for months, other than a very short test ride the day before the triathlon. This created a certain degree of nervousness on my part. Roads and particularly cars, trucks and busses are dangerous. I’m not a fan of cycling at high speed on open roads. Furthermore, I guess you can train all you like in the kitchen but nothing will prepare you for the real world like real world cycling. There are so many more things to contend with outdoors and you use many more muscle groups on a real ride because you are having to keep the bike upright for a start and contending with wind and uneven road surfaces. So, that should all go some way to explaining why I was so slow on the bike!! I was passed by so many riders during this section and I really felt I had very little power in my legs. I wasn’t tired. I had energy. Just no power. My position on the bike wasn’t good and my form was poor. I did pass a few cyclists myself but they were obviously the slower riders, some on mountain bikes. I didn’t pass any riders who I would class as competitive. 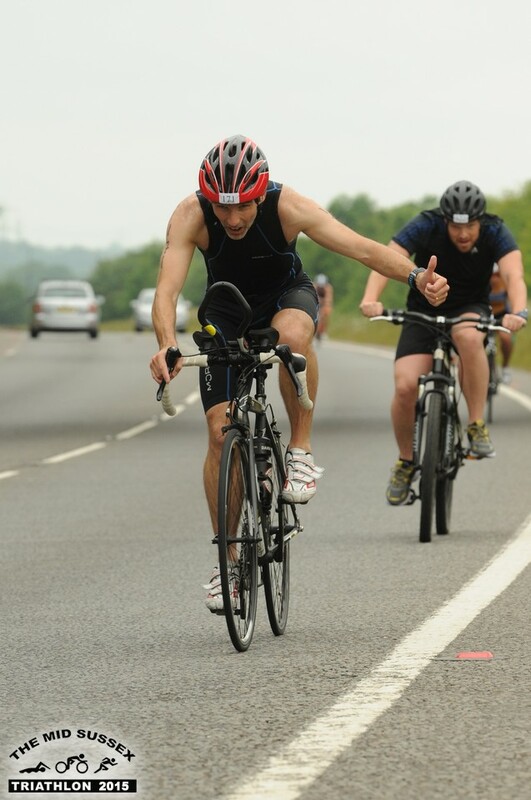 However, the Mid Sussex Triathlon was my first triathlon and this was likely to be my weakest discipline. I can’t really be too disappointed and I can only improve in my next races. I just have to remember that I ran my first marathon in 2012 in 3 hours 43 minutes and three years later I am exactly half an hour faster at 3:13. I finished the bike in 53 minutes. The official results tell me my bike time was 57:24. This is because they add both transition times to the bike portion of the race. The fastest cyclists completed the 25km in 40 minutes including transition times. So I need to improve my bike time by at least 10 minutes and probably 13 minutes to be at all competitive. I’m sure that’s doable but it will take some training and training takes time, of which I don’t have a huge amount, what with my job, my children, family/wife time, marathons, editing films, writing blog posts. I used to be musician you know….can’t remember the last time I wrote and recorded a song. Ah well. Back in to the transition area, dismounting the bike before the yellow line. Off with the cycling shoes, on with the running shoes, which I should have had loosely tied before putting them on. I could have cut a few seconds off by just being able to slip my shoes on. Running is what I know and what I am best at of the three disciplines. I was pleased to finally be overtaking people….lots of people. Many of the good cyclists who had passed me on the bike were not so hot on their feet and I caught a good few back up on the 5km run. The route was a simple 2.5km out to a marshalled turn and then back again, finishing on the grass at the front of Burgess Hill Triangle. For me it was a bit slow, way over a minute below my PB, but I guess I had just swum 400m and cycled 25k. I came in at 20:18. I finished feeling pretty good and very happy to have completed my first triathlon without any major disasters! My wife was sure I’d come off the bike at some point and I passed a few casualties on the bike route. One lady told me her chain had come off 6 times. 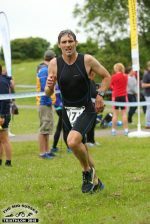 So just to have finished the Mid Sussex Triathlon is an achievement it seems! Rarely at running events does one get to shower and change after the event, so it was lovely to use the leisure centre changing facilities to have a decent warm shower before the prize giving. Sticking to the family friendly vibe there was lots of free stuff given away including stuff for the children. As well as medals for the adults who had taken part, there were also enough medals made to give extra ones to children. I know from experience how much children love having Daddy’s running medals. My official finish time was 1 hour 25 minutes 37 seconds. The winner finished in 1 hour 6 minutes 17 seconds, some 19 minutes ahead of me. If I am to win next time I need to knock 2 minutes off my swim time, 16 minutes off my bike and a minute off my run! I came in 124th place overall. Looking at the results in the excel file and re-organising the columns a bit I’ve worked out that I came 113th in the swim, 193rd on the bike and 11th in the run out of 266 who completed the triathlon. 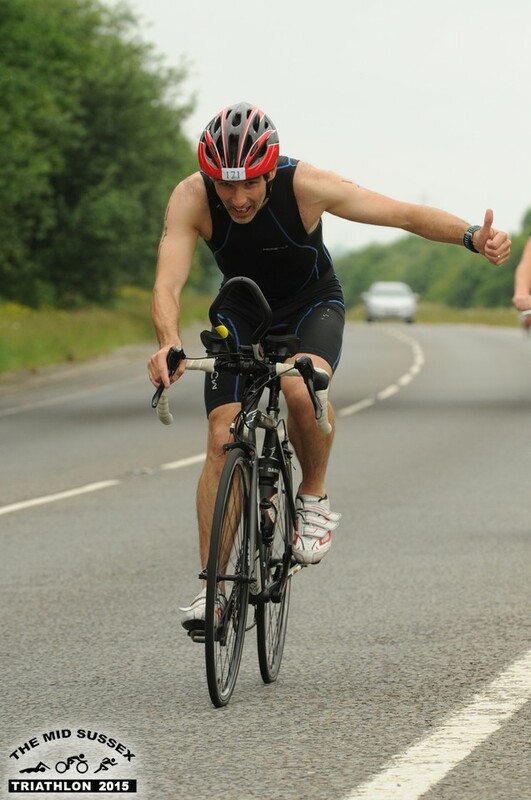 Pleased with the run, swim is acceptable but the bike can definitely be improved. 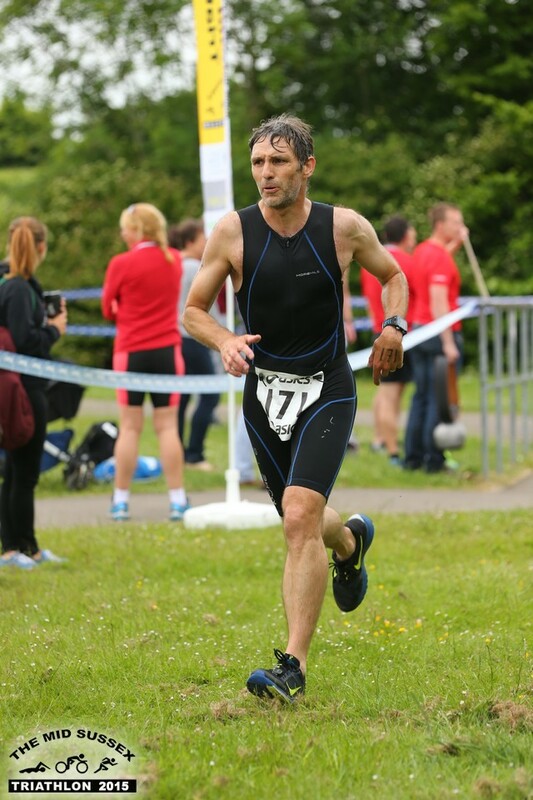 I thoroughly enjoyed my first triathlon experience and I hope to be back again next year for the same event. 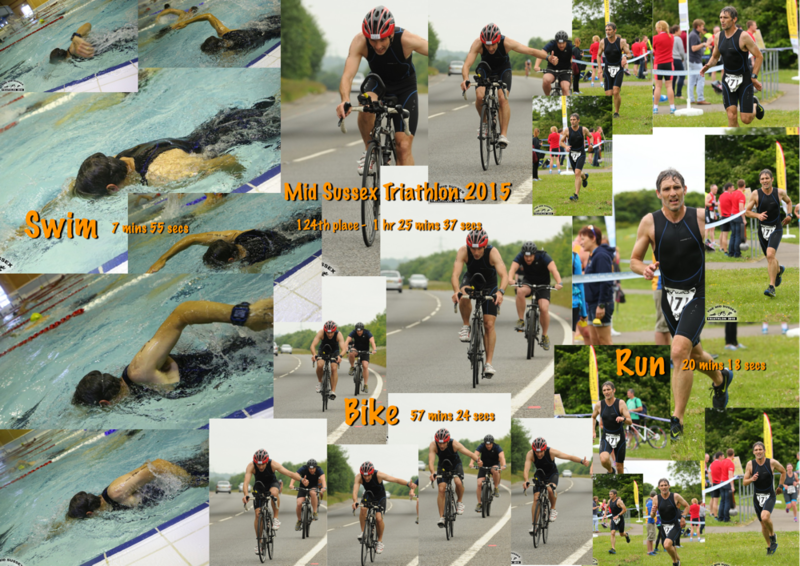 Thanks to Mid Sussex Triathlon Club for putting on such a family friendly race. Well done and thanks as always to the volunteer marshals, timekeepers and supporters. Please share this race report and film with others if you think they might enjoy seeing it.